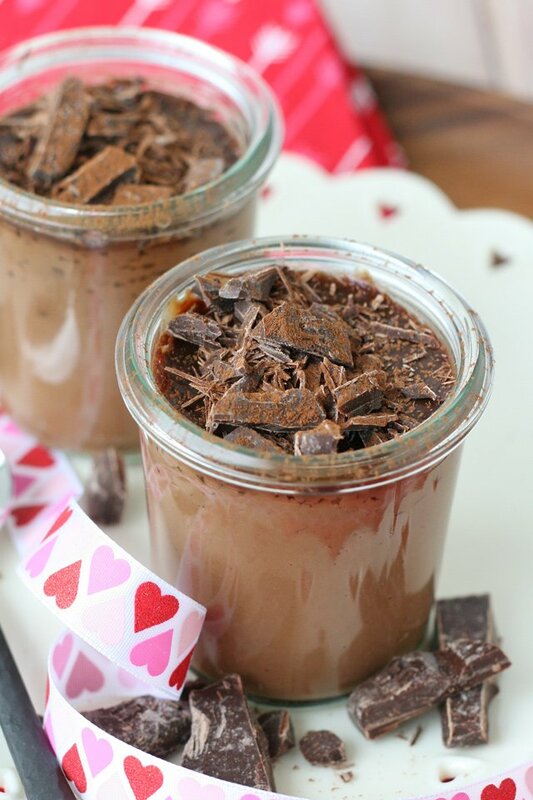 Rich, creamy, indulgent… this Chocolate Pots de Creme recipe is simply the perfect Valentine’s Day treat! Pot de Creme (pronounced poh-de-krem) is french for “pot of cream” or “pot of custard”. 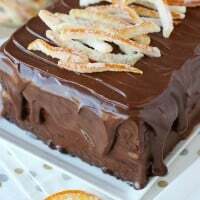 This seemingly fancy dessert is quite easy to make at home and is a simply incredible chocolate treat! 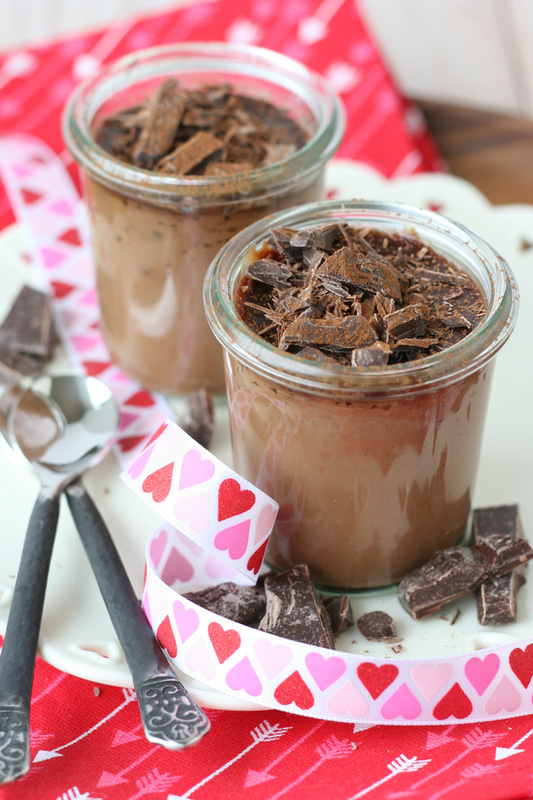 Pot de creme is similar to chocolate pudding, but a bit richer and a bit thicker. One of my favorite things about this dessert is that it can be made in advance (in fact it must be) and kept in the fridge until serving. So it’s perfect to make early in the day (or the day before serving) and then it’s ready to be enjoyed after dinner, with no last minute prep. 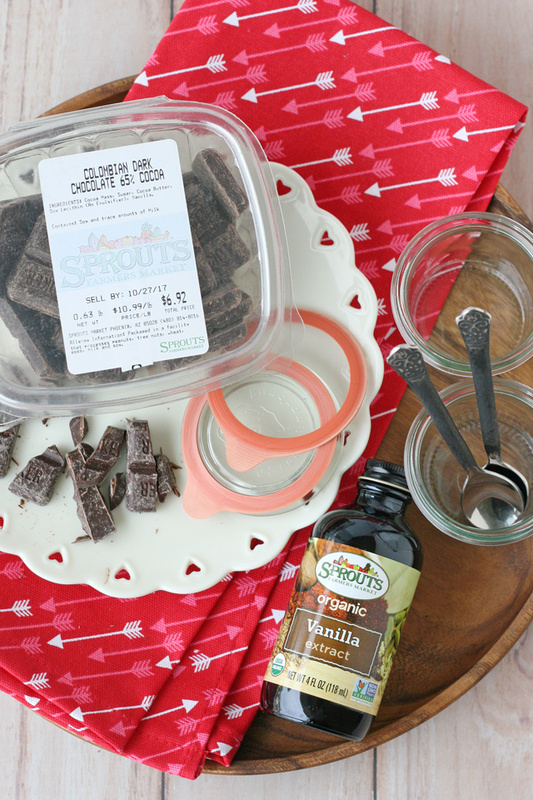 Sprouts carries all of the high quality ingredients you’ll need for this delicious recipe. This recipe has a quite short list of ingredients and is designed to highlight the chocolate, so choosing good quality chocolate is key! I chose 65% Cocoa Colombian Dark Chocolate, available in Sprouts bulk bin section. I added a bit of extra chopped chocolate on the top of the desserts as garnish, but feel free to dress the desserts as you wish. Sprouts always has a fun selection of seasonal candies, so look for their seasonal display (near the bulk bins) and you’re sure to find something to add as a pretty garnish. Of course if you’re feeling generous and want to share with more than one person, feel free to double or triple the recipe. 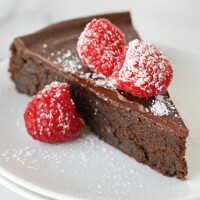 This ultra-rich chocolate treat is perfect to share with someone you love! Choose two small jars or ramekins for the dessert. The dishes need to be oven safe and need to be able to hold ¾ cup liquid. Preheat oven to 300°F and place a baking dish (such as a loaf pan) in the oven with enough hot water to mostly come up the sides of whatever sized dish you’ll be serving the dessert in. In a small saucepan, heat heavy cream, milk and sugar until the mixture is hot (but not boiling) and the sugar has dissolved. Turn off the heat under the pan and add chopped chocolate to the hot milk mixture. Allow chocolate to sit in the hot milk undisturbed about a minute, then stir to combine and until fully melted. Add salt and vanilla. In a small bowl, add egg yolks and whisk (or stir with a fork). Add a tablespoon of the hot chocolate mixture to the egg and stir well. Continue adding a tablespoon or so at a time until you’ve added at least 5-6 tablespoons and the egg mixture is warm. Add entire egg mixture to the saucepan and turn the stove back on to medium-low. Heat, while slowly whisking and cook for 2-3 minutes or until the mixture has thickened to almost the consistency of pudding. Immediately remove from heat and pour into your two jars or ramekins. Retrieve the pan of hot water from the oven, place jars in the center and return to the oven to bake for 20-25 minutes. Remove desserts from the oven when the edges of the dessert are set, but the center is still quite soft (the center should jiggle a bit, but not appear fully liquid). Cool desserts on a cooling rack for 15 minutes or more, and then move to the refrigerator to chill and firm up, at least 2-3 hours. Serve well chilled. 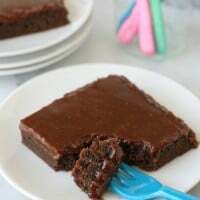 Desserts may be made up to 2 days in advance. Cover dishes in the refrigerator if chilling overnight. This recipe is scaled to make two (3/4 cup) desserts. Feel free to double or triple the recipe as desired. If using Sprouts Colombian Dark Chocolate (as shown), and if you do not have a food scale, I calculated that each full sized piece of chocolate (as it comes in the container shown) is 1/3 of an ounce. Since the weight of each package in on the package label, feel free to calculate how many ounces are in the package you purchased, and count the total pieces of chocolate if you'd like to confirm the weight of the individual pieces. It looks absolutely delicious! YUM! Yes, please . . . do you have a little chopped, toasted pecans to throw on top of mine? ? ? Looks great. 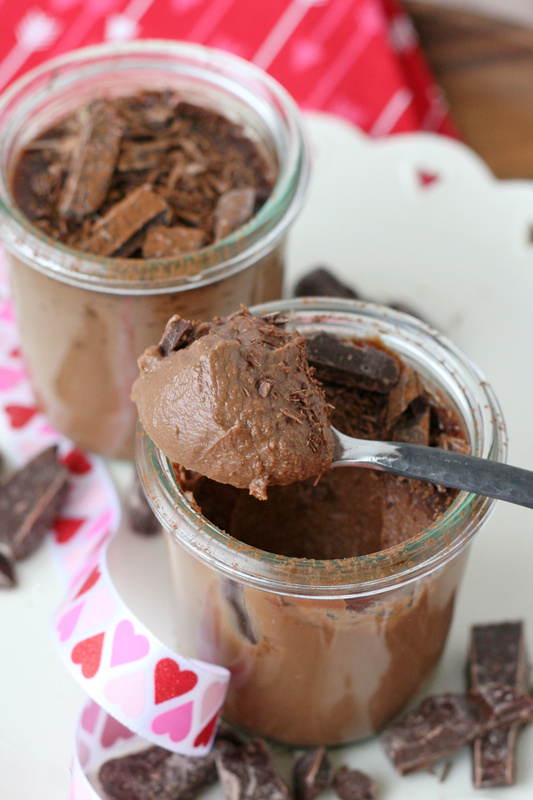 A grown up chocolate pudding. Yum! 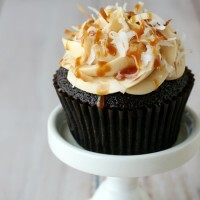 My mouth is seriously watering right now. 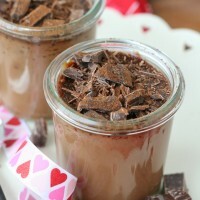 As a self proclaimed chocoholic I must have this. That’s so funny, I just put up a recipe for pots de creme too!! Yours was up way before mine though. But it is funny that just today I thought “I wonder what glory is up to?”. These look beautiful and delicious!